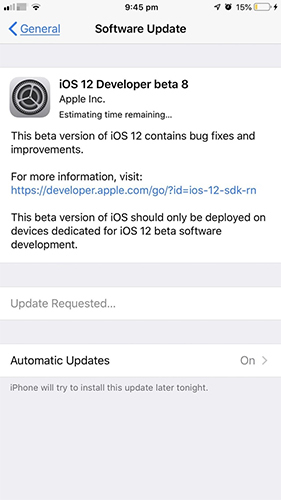 "I was very excited with the new iOS 12 launch, so, I started to update my iPhone immediately but it is taking forever to download the update. The previous update only takes half an hours but this time it has already been 5 hours, please help!" As usual with the launch of the new iOS update, Apple also released a new set of problems, which is making most of the users cry for help. For most people, the iOS 12/12.1/12.2 update takes forever or the procedure is getting frozen midway. Apple still hasn't addressed the problems, so here is the list of 5 very effective solutions that may solve this inexcusable situation. Part 1: How Long Does iOS 12/12.1 Update Take? The main problem the users are facing is that the iOS 12 update is taking a very long time. But the question is how long does the new iOS 12 updates take? The answer is more or less 30 minutes. There are a lot of variables like your skill set, the internet speed etc. Unfortunately, if it takes an unusually long time to update then you have a big problem on your hands. So, if your iOS 12 is actually frozen then you can follow the 5 ways to fix it that we have mentioned below. It is terrible if iOS 12 update takes too long. It will be better if you start the update from the scratch. 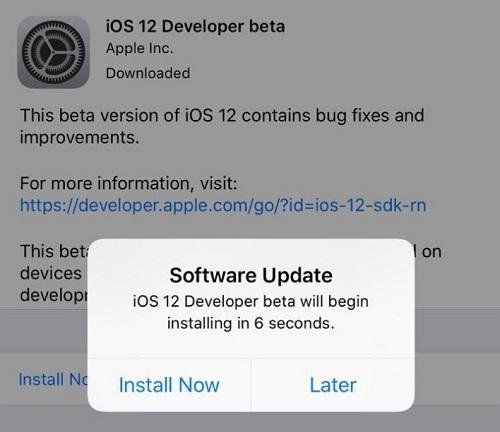 After the release of iOS 12, a lot of overly excited users started to download and install the update immediately but some of them were not that lucky. Basically, you have a problem and you need to fix it immediately, otherwise, you won't be able to proceed with the update. For the moment, you can try these solutions to fix the device. If you are using iPhone 8/X/XS then you have to press and hold Volume Up key and then the Volume Down key. Now hold the Power Key and release when the Apple Logo is visible on the screen. For iPhone 7/7Plus, press the Power and the Volume down key together until you see the Apple logo. 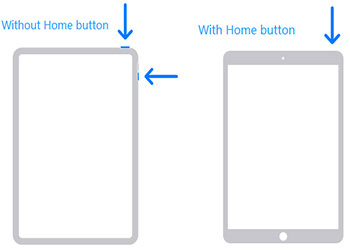 If you are using iPhone 6 or any earlier model of iPhone or iPad then you need to hold the Home button and the Sleep button together for at least 10 seconds until you see the Apple logo. After you have restarted the device, you can try again to update the iOS, hopefully, this time you will succeed. Sometimes, a weak or unstable network could be the cause for iOS 12 update freezing. It is very crucial that you connect to a strong and stable network so that the update can be done successfully. So, what you must do is check the network settings very thoroughly right before the installation. Step 1: Go to "Settings" and then navigate to "WLAN" and open Wi-Fi settings. Step 2: Turn off Wi-Fi for a while and enable it again. You can also go to the Settings of your iPhone, after that head to "General" and select "Reset Network Settings", under "Reset". Keep in mind, your entire Cellular Network will get a reset, including the password, APN, AVN, and Wi-Fi passwords etc. After that, reconnect to a steady Wi-Fi and resume iOS 12 update and install. These are the steps you can take to ensure that you have a strong and a stable Network. You can also turn on the Airplane Mode, it will turn off the Wi-Fi for the moment and then you can activate it again later. It is very much possible that your iPhone frozen during update iOS 12 because you don't have enough available space to install such a major update. The iOS 12 update requires at least 3GB storage space but if you don't have that much available then you can either stop the update for the moment or clear up some space by deleting some less important files and apps. So, before you even think about updating the iOS, check how much space you have left. Step 1: Open your iPhone and go to the "Settings" app. Step 2: Head to "General" followed by "iPhone Storage". After you head to iPhone Storage the amount of used space and empty will be visible to you, you can also offload apps and even upload your entire library to iCloud to free space for the update. Clear out app caches and browser caches or any type of junk files. Delete unnecessary data and files. Backup files to another device so as to save storage. And for all these, you can simply use Tenorshare iCareFone Cleaner to free up space and enhance the performance of your device along with it. It is a potent cleaner tool that is easy to use and extremely efficient as well. It can easily wipe out junk files, temporary files and large files with just 1-click. So, if you need to clear up space, we highly recommend Tenorshare iCareFone Cleaner. Simply the best choice in this regard! This is a very different procedure! You simply have to erase your device completely and start the update from the beginning. But we are not asking you to let go of your precious files, you can make a backup beforehand using iTunes, iCloud or if you want a better free option than these two, simply go for none other than Tenorshare iCareFone. This iOS file manager tool can backup everything from your iPhone and that too selectively. You will have full access to the data as well. These features are not available on both iCloud and iTunes. So, choose wisely! Step 1: Go to the "Settings" of your iPhone and then head to "General". Step 2: There you must find the option called "Reset". Step 4: Now finally, tap "Erase iPhone". This will erase your iPhone. Now restore the backup you have done previously. You can use iCareFone here as well. This whole procedure is very simple but you must make the backup so that you can start your iOS update again afresh. This may solve the issue. If none of the procedures above are working then the only option you have is to repair the iOS itself. There are a lot of programs available that can perform a complete iOS repair but we are going to recommend best iOS system recovery software - ReiBoot. It can fix any type of stuck issue, iPhone restart loop, iOS system problems, and iPhone crashes , etc. So, just follow the steps below to get a complete iOS repair using ReiBoot. Step 1: You need to download ReiBoot on your computer. You can use a PC or Mac as this software supports both of the devices. Step 2: Then you need to launch the setup file to install it, after that, you can run the program. Step 3: Find a lightning cable and connect the stuck iPhone and computer together. Step 4: Then on the main interface of the software you can click on "Fix All iOS Stuck"
Step 5: On the next page you will be prompted to download the IPSW file, so, select a destination and choose "Download". Step 6: The software will proceed with the download, when it is done you can go and click on "Start Repair". This is the complete repairing procedure of Tenorshare ReiBoot, now you will be able to use your device without any problems because ReiBoot has already downloaded the newest iOS 12 firmware and installed it on your iPhone. Don't miss this amazing tool! So, here we have the most effective ways to fix your iOS device if it gets stuck or frozen during the new iOS 12 update. Unfortunately, without any official response, we are in the middle of nowhere. But we have discussed 5 of the best iOS repair procedures above, and hopefully, they will come to your rescue. Go for ReiBoot if you want a hassle-free and smooth experience in the first place!